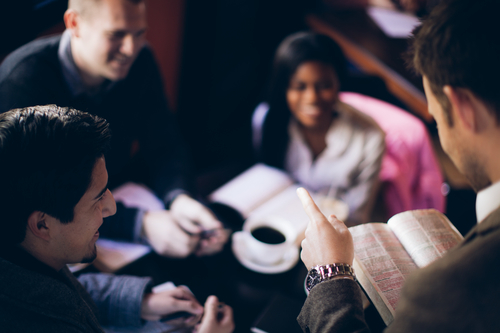 Dwelling in the Word Handouts–English Morando en la Palabra–Español The Discerning Our Common Call Steering Committee invites you to join us in reflection on scripture at your monthly meetings. Every group in the Diocese of New Jersey – congregational Vestries and committees, diocesan task forces, boards and committees – are invited to “Dwell in the Word” together monthly, beginning in December, as the season of Advent leads us into a new year. Last May, Bishop Stokes expressed to a circle of diocesan leaders his strong feeling that the Diocese of New Jersey and each of its congregations had one purpose: “to form people as disciples of Jesus Christ to carry out Christ’s mission of reconciliation in the world.” According to Bishop Stokes, “Discipleship is about knowing Jesus intimately through our engagement with his story as it is found in Scripture as well as in the life of the Church, and then, in response to this, living our lives in the world in his love.” Reflecting on the importance of using “Dwelling in the Word” as a spiritual discipline and practice for the entire diocese, he writes, “Through the power of the Holy Spirit, ‘Dwelling in the Word’ invites us to grow in our knowledge and love of Jesus so that we and the world can be transformed by and in that love. In this, wondrous things occur.” Complete instructions, along with the assigned scripture passages and reflection questions are linked above in English and Spanish, with a single sheet ready to reproduce and distribute for each month’s meeting from December through February. These Dwelling in the Word resources will be released quarterly through November 2019. We would be delighted to hear about your experience with this reflection tool, or your questions, at DOCC@dioceseofnj.org. 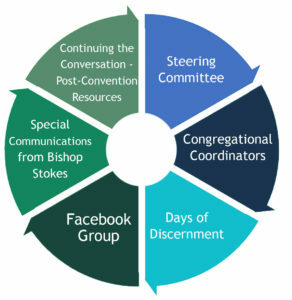 As people and groups throughout the diocese engage in the same process of reflection on the same scripture passage each month, we will support the ongoing discernment of the diocese and grow in unity. Please join us in this holy reflection as you carry out your part of God’s mission and ministry in New Jersey and in your own community.